They say that everything is bigger in Texas. Unfortunately, that oversized attitude doesn’t just apply to cowboy hats and plates of brisket—summer temperatures fit the bill as well. In San Marcos and the surrounding area, the hot weather starts in May with averages in the 80s. By June, it’s in the 90s, and it stays that way until October. And that infamous Texas humidity makes it feel even hotter. But in San Marcos, there’s no need to spend summer indoors bound by the air-conditioner. Thanks to the San Marcos River, which runs through the city and stays at a perfect 72-degrees year-round, you can enjoy the outdoors without melting like a popsicle. The San Marcos River is the ideal spot for leisurely days and adventure-packed weekend trips. From classic Texas swimming holes to float trips, here’s how to make the river the center of an enjoyable summer trip to San Marcos. Tubing is the San Marcos River activity. Floating down the water beneath a canopy of trees has long been a favorite way to spend a summer day. The water flows at a leisurely pace, making this a family-friendly activity. You can bring a tube or rent one from the Lions Club Tube Rental at San Marcos City Park, where you’ll be able to float from City Park to Rio Vista Park and then shuttle back. For a more extended, party-barge style experience where you can drink beer on a water safari with all of your friends, set up a trip with Texas State Tubes and enjoy a more curated adventure. The San Marcos River is one of the most biologically diverse aquatic ecosystems in the country—but don’t take our word for it. Find out for yourself by getting beneath the surface. By snorkeling the San Marcos River, you can swim alongside red-eared turtles through underwater fields of Texas wild rice. The San Marcos River is home to several endangered species including the Texas blind salamander and the fountain darter, a small freshwater fish. 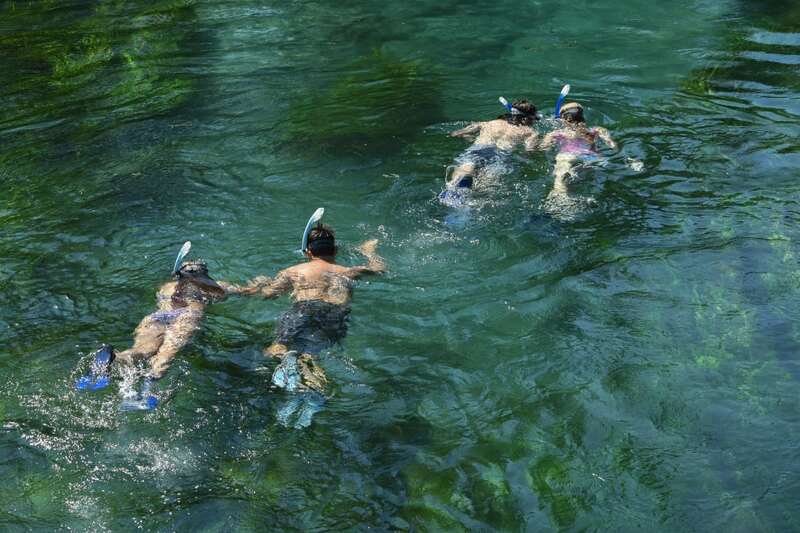 You may catch a glimpse of these aquatic creatures, plus many other types of flora and fauna that call the river home by snorkeling in the cool, clear river. Take a guided tour downstream or do a self-guided tour with Snorkel TX. They supply the masks and snorkels; you bring the sense of adventure. You’ll even have the option of adding on a personalized video of your time underwater. 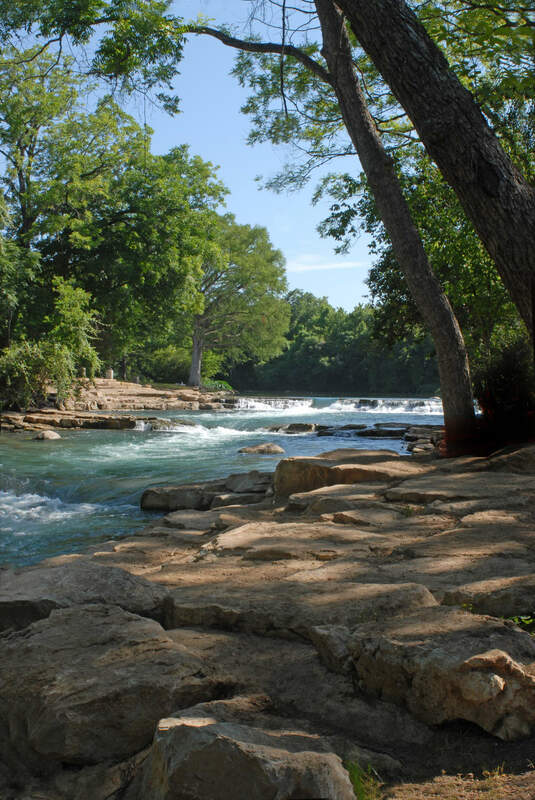 Get a little exercise and score some great views by hiking alongside the San Marcos River. One option is the easy San Marcos Riverwalk. This 2.4-mile trail takes you through San Marcos and then meanders around the river. Because this short hike is part urban adventure and part wildlife journey, it’s easy to do after grabbing lunch downtown or even after a day at the office. Be sure to bring your bathing suit. After working up a sweat on your walk or run, you’ll want to cool off in the water. Another great aquatic hike starts from the Meadows Center for Water and the Environment. You won’t be able to jump into the water here, but you will be able to enjoy a boardwalk stroll through the wetlands. If you’re curious to learn more about the history of the Edwards Aquifer or the various types of plants and animals that live in the river habitat, download the Wetlands Walk podcast for a free self-guided audio tour. You can also visit the on-site educational exhibits to learn even more. When the summer heat wave is in full effect, it’s time to head to Rio Vista Park. You’ll find plenty of places to take a dip and cool off, but the waterfall chutes are the real highlights. Don’t worry—we’re not talking Niagara Falls-sized drops. These waterfall chutes offer just the right amount of refreshment and adventure. You can go over them in a tube, practice your whitewater kayaking moves or even grab your surfboard and hang ten. If the waterfall chutes aren’t your thing, you can still have fun watching kayakers practice their stunts while you soak up the sun on a nearby rock. If those waterfall chutes awaken your inner whitewater kayaker, live your dreams in real life by trying a boat at CabanaSMTX, which offers half-day and full-day rentals. If you’ve never kayaked before, you can take a class and learn from the professionals. Whether you’re a beginner or an expert looking to improve your whitewater skills, they can get you where you need to go. Feel like you’re walking on water by riding a stand-up paddleboard this summer in San Marcos, with rentals available at CabanaSMTX. This is a leisurely way to paddle the river, with ample opportunities to dive in and cool off. After dark, you can opt for a paddleboard glow tour. 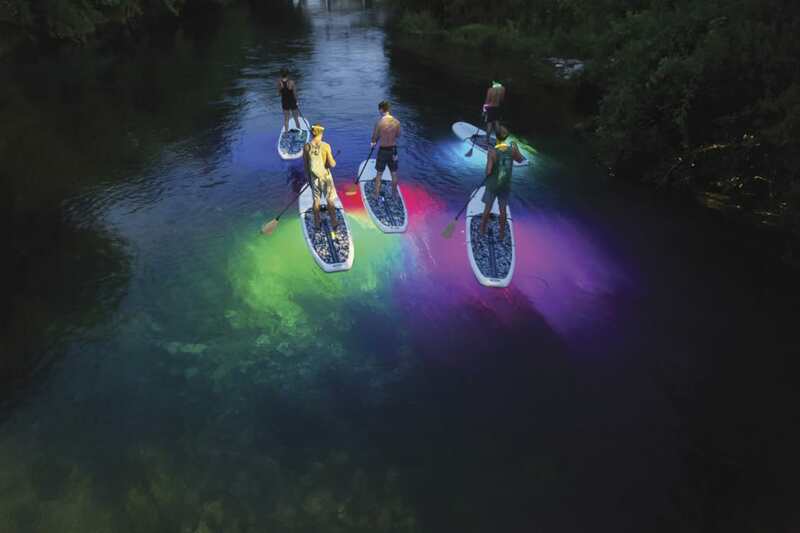 This unique—and incredibly Instagrammable—tour will set you up with your own stand-up paddleboard outfitted with underwater LED lights, plus plenty of glow sticks to get the river party started.